- By Maureen McManus - Article for The High River Times - October 14, 2002. Real cowboys do drink cappuccino, and now they can find it in Longview. "Cowboys like their coffee hot," said singer-songwriter Ian Tyson, who recently opened a take-out coffee house on the main street of his village. He has called his latest enterprise Ian Tyson's Navajo Mug. This is a play on words from the 1986 song Navajo Rug which he wrote with Tom Russell. The song includes a reference to "roadhouse coffee" and can be heard on Tyson's best-selling Cowboyography album. Navajo Rug was also recorded at East Longview Hall a year ago for Tyson's latest album, Live at Longview. Because Tyson and his wife Twylla live in the Longview area, they talked about adding something to the village that would be relevant and fun. Tyson was aware that tourists went to The Cook House and Memories Inn asking about Tyson souvenirs. "This planted the seed of having an art gallery and good coffee to serve the community," said Tyson. "When the saddle shop went up for sale, we asked ourselves, 'Why not?'" Before it was a saddle shop, the wooden building was a church and a school. It is now painted in a south-western style with adobe and blue paint. Ian designed the interior's coffee bar, art gallery and gift shop, then Twylla's brother worked on the construction. The gift shop has French doors leading to a deck and work-in-progress garden. Tyson said, although there were some frustrating times during the planning process, he is really enjoying the coffee house now. One of the frustrations this summer was not being able to find someone suitable to lease the building and operate the business. Tyson said he didn't want an employer-employee relationship. Now, he has a business partner, operator-lessee Sheila Sander, whose parents and brother live in Longview. Sander recently moved from Saskatoon and now lives in the apartment above the coffee house. Her daughter, Christie, works with her at the Navajo Mug, where they put in long hours from 7 a.m.-7 p.m. six days a week. At the coffee bar, the Sanders serve specialty coffees such as cappuccino, espresso, mocha mud slide and caramel crunch. Tyson brought in the singer's merchandise for the gift shop, while Sander acquired the other high-end gift items. Adding to the attractions at the coffee house are western-style works of art including reproductions of Charlie Russell's western paintings. Asked what is next on his wide, western horizon, Tyson said his family's lives have changed since his daughter, Adelita, became a rodeo-circuit barrel racer. Twylla and Adelita are on the road a lot now, while Ian tends their working ranch near Longview. Previously, it was Twylla who took care of the ranch while Ian was travelling with his music business. Sixteen-year-old Adelita is working on her riding technique to qualify for the National Finals Rodeo in Las Vegas once she reaches age 18. Meanwhile, back in Longview, work-in-progress continues at Ian Tyson's Navajo Mug, the "grand opening" of which will likely be in November. - By Maureen McManus - Article for The High River Times - July 30, 2002. "Once our beer was frothy, but now it's frothy coffee, and fings ain't what they used to be." - Lonnie Donnegan song, 1950s. Singer-songwriter Ian Tyson remembers this song, and now he's opening a frothy-coffee house on the main street of colourful Longview. It seems "fings" are returning to what they used to be at carefree coffee bars when Tyson was a callow fellow. "Ian's Navajo Mug" is the name Tyson has chosen for his coffee house. "Several people suggested this name. It's corny, so it will be remembered," he said. However, don't expect Tyson to be on duty serving coffee whenever you visit. He has arranged to lease the business to an operator. The staff will serve take-out Kananaskis cappuccino, latté and mocha to the many people who travel through Longview. "With the growing traffic through Longview, there's a demand for upscale snacks and coffee," Tyson noted. The coffee house is conveniently located in the west-side adobe-and-blue building, which has been a church, a school and a saddle shop. Tyson said he and his wife Twylla talked about adding something to Longview that would be relevant and fun, then the saddle shop came up for sale. 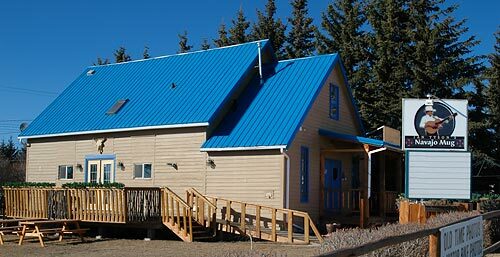 The building has been newly-equipped and renovated for Ian's Navajo Mug, including a gift shop and an outside deck. The visitors will be able to pick up their coffee and snacks, buy Mexican rugs and CDs in the gift shop, and then relax on the deck, said Tyson. In short, it will be a perfect place for tourists and residents to spend some summer wages. Tyson intends to encourage local musicians by holding CD release parties at the coffee house. However, he doesn't want the place to get "swamped" because it is only suitable for small events. Tyson plans to have fun with this latest project, which he is adding to his music and ranching enterprises. Owning a coffee house has been a long-held dream. Obviously, Tyson has no plans to go quietly into retirement. Instead, he is methodically turning the pages of his latest work in progress.